The European Commission’s decision to fine Google €4.34 billion for abuse of market power has been accused of being politically motivated and of risking higher prices for consumers. This column argues that the Commission’s decision has economic merit and falls within established legal precedent. As mobile search is the key gateway to access information, we should be concerned about dominance in this market for its potential distortionary effects on innovation and consumer outcomes across multiple other markets. On 19 July 2018, the European Commission announced it was fining Google €4.34 billion for “[using] Android as a vehicle to cement its dominance as a search engine”. The decision has already been described by various commentators (including President Trump) as politically motivated, reflecting an ongoing ‘techlash’ by the European competition authorities against successful (US) tech firms. It has also been accused of undermining Android’s ‘free’ business model and risking higher prices for consumers. This misses the mark. The European Commission’s theory of harm is economically well founded and there are legitimate questions on the effects of Google’s conduct on innovation and consumers. A few ‘myths’ need to be dispelled before one can sensibly discuss the merits of the Commission’s analysis. Myth 1. This is another case about Google abusing its market power in search. No. While Google has been accused of using its market position as a search engine to undermine its competitors, this case is about Google using its dominance elsewhere (the Google Play app store) to entrench its position in search. Myth 2. The European Commission assumes away competition between Google and Apple. No. The ‘theory of harm’ is consistent with significant retail competition between iPhone and premium Android devices like the Samsung Galaxy. The question is not whether Android and Apple devices are in competition with each other at this retail level, but whether this ‘indirect constraint’ is sufficient to undermine Google’s upstream market power in its relationship with phone manufacturers. It is not. Myth 3. There cannot be anticompetitive effects when competition is ‘a click away’. No. A key question in the case is the extent to which granting a search engine or app default status results in significant changes in its level of usage. This is a purely empirical question. The evidence points to material effects. Myth 4. This is the end of ‘free’ installation and means consumers having to pay more. It is not clear how Google will react but, even if it was to make some changes to the way Android is monetised, this is not necessarily a bad thing. If manufacturers face the true costs and benefits of choosing between operating systems and default search engines, it seems likely the outcome will be more competition and innovation in aggregate, not less. What was the ‘theory of harm’ in the Android case? The concern was that this combination of pre-installation and default status, cemented by contractual restrictions with exclusivity effects, limited the scope for rival search engines to gain traction. Search engines exhibit scale effects: in order to ‘train’ a search algorithm one needs a sufficient volume of data, but accessing such data requires a sufficient volume of queries. Absent Google’s conduct, a natural entry/expansion strategy for a search engine would have been to pay manufacturers for default status in order to get an initial volume of queries which could be used to improve the quality of its product and compete more effectively. Google’s practices made such strategies more difficult as any search engine would have needed to compensate smartphone manufacturers for the loss of GP – something which may be prohibitively costly even for a rival with comparable, or even superior, search technology to Google. At the heart of the Android case therefore is a story in the tradition of the antitrust cases brought against Microsoft (where the accusation was that Microsoft was bundling its operating system and browser to prevent the emergence of rival browsers that could ‘morph’ into alternatives to Windows). The concern is not exotic, but the facts need to be shown to stack up: Is Google Play in a position of significant market power? Is default status sufficiently important to ‘foreclose’ rival search engines? What are Google’s anticompetitive incentives? Default status matters. While it might be tempting to dismiss concerns on the basis that ‘competition is a click away’, the evidence in fact shows that default status is a powerful tool to influence user behaviour. It is significant that Google reportedly paid Apple $1 billion for default status on the iPhone in 2014 and upwards of $3 billion in 2017. Why pay so much if default status is unimportant and consumers will naturally gravitate to their preferred search engine? Data on consumer behaviour also show a tendency towards ‘default bias’. 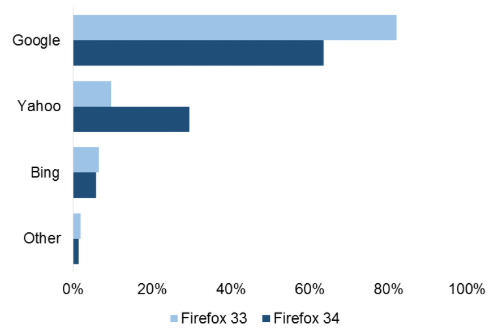 When Yahoo paid Mozilla for default status in Firefox 34, it saw a 20 percentage point increase in its sharerelative to users of Firefox 33. Google Pay is critical for manufacturers of Android smartphones. It accounts for the vast majority of app downloads on the Android platform as well as a large share of available apps. More generally, the evidence seems to us to supports that Android manufacturers cannot compete effectively without Google Play. Source: “Android App Store Market Overview’, Onepf.org, 2013, accessed February 2015. Android is a key distribution channel for mobile search engines. Google’s conduct would not prevent rival search engines from competing if they had a wide range of alternative distribution channels besides Android. However, Android accounts for upwards of70% of mobile devicesand the remainder primarily run on iOS where Google Search is also set as the default. Is the European Commission ignoring Apple? The Commission is being criticised for ignoring competition between Apple and Android in focusing on ‘licensable’ app stores. However, there is no inconsistency between this approach and the existence of material retail competition between Apple and Android devices. The decision as to whether to install Google Play/Android on a device rests with the manufacturer,not the consumer. Manufacturers cannot install non-licensable app-stores (such as Apple’s). So, can indirect competition at the retail level undermine the hold Google has over manufacturers? What do we mean by indirect constraints? There are circumstances where ‘indirect constraints’ can negate an ‘upstream’ firm’s market power. But the evidence points to Google Play having significant market power notwithstanding them (e.g. because of significant differentiation between Apple and Android devices in terms of price/functionality, and inter-platform switching costs). Furthermore, the fact that Google was also the default search engine on Apple means that these kind of indirect constraints cannot really solve the issue of Google denying scale to rival search engines. The European Commission’s decision has economic merit and falls within established legal precedent. More importantly, this is a market of real import – mobile search is the key gateway to access information, and we should worry about dominance in this market for its potential distortionary effects on innovation and consumer outcomes across multiple other markets. Authors’ note: The authors of this column all worked on this matter on behalf of Yandex, a Russian search engine, both before the Russian FAS and the European Commision. This note does not represent the views of CRA, nor those of other CRA experts. Choi, J P and D S Jeon (2018), “A Leverage Theory of Tying in Two-Sided Markets”, mimeo, Toulouse School of Economics. Choi, J P and C Stefanadis (2001), “Tying, Investment, and the Dynamic Leverage Theory”, Rand Journal of Economics. Carlton, D and M Waldman (2002), “The Strategic Use of Tying to Preserve and Create Market Power in Evolving Industries”, Rand Journal of Economics. Etro, F and C Caffarra (2017), “On the Economics of the Android case”, European Competition Journal. The Commission also raised concerns about Google making access to Google Play conditional on manufacturers not installing ‘forked’ versions of Android but we do not consider this aspect of the case in this note. See Choi and Jeon (2018) and Etro and Caffarra (2017). The latter builds on the former and explicitly considers the role of payments to manufacturers, showingthat Google has an incentive to engage in a tying strategy to better extract consumer surplus in the presence of price constraints or differentiation in consumer preferences concerning Google Play, and that such a tying strategy forecloses entry and harms consumers.